Once upon a time, Suzdal was the center of Russia. It was the capital when Moscow was a tiny backwater town, and for a while Suzdal had all the wealth and power….and then it didn’t. Suzdal was left out during much of the growth and prosperity of the last several hundred years, failing even to get its own railway line. To reach Suzdal, we had to take a bus from Vladimir. For a while, Suzdal became a sort of craftsman center. Then it reinvented itself as at center for tourism. And oh my: it is so heavily touristic that I can’t imagine anyone actually living there. Except that the many beautiful churches and buildings are clearly ancient, Suzdal feels a bit like a manufactured village. Nothing is real; everything is manufactured. That is clearly not the case, but it was the sense I got. A note on the tourist map mentions that the local population is around 12,000, and of that number roughly 50% work in a trade related to tourism. Both Steve and I thought that percentage seemed low. This lovely church was one of the first views we encountered in Suzdal, walking down from our hotel towards the center of town. It’s also one of the few we didn’t visit, as it’s not highlighted in the guidebooks. I enjoy Suzdal more when I think of it as one big open air museum. The Cathedral of the Nativity of the Virgin. This is probably the most picturesque (and so most famous) church in Suzdal. It was on all the magnets at all the tourist stands. A closer look at the Cathedral of the Nativity of the Virgin. Inside the Cathedral of the Nativity of the Virgin. Here you can see part of the wall where restoration was left partially incomplete, allowing visitors to see the original next to the restored version. One of the paintings on the wall inside the Cathedral of the Nativity of the Virgin. A door from the Cathedral of the Nativity of the Virgin. This door is no longer in use, but is displayed for tourists. It’s difficult to look anywhere in Suzdal without seeing a number of beautiful towers and steeples. Here is one of my favorite ensembles. Suzdal was full of wooden houses, as have been all the towns we’ve visited in Russia. I probably liked this one because of the yellow flowers. There are really so many churches in Suzdal, it’s next to impossible for me to identify all of them. I’m pretty sure this is a view of the Ensemble of the Convent of the Intercession. The Cathedral of the Intercession with the belfry and the gallery. This is part of the Ensemble of the Convent of the Intercession. The grounds were very beautiful, and the place is a working convent. We bought water at a small cafe on the grounds, and the women working at the cafe were both nuns (or novices?). They were very young. This was also at the Ensemble of the Convent of the Intercession. I liked this picture because it really shows how, no matter which direction you look, there are more churches in the background. Church garden in the St Euthymus Monastery of our Savior complex. The belltower the St. Euthymus Monastery of Our Savior. We came into the complex near the top of the hour, and as we stood in the courtyard they bells began to play. It was a long and beautiful “concert”, lasting perhaps 15 minutes. Here you can see the man playing the bells. This was quite incredible. There was only one man, but something like 19 bells. One man rang them all; there were ropes and other apparatus that allowed him to play them all from a single position. The Cathedral of the Transfiguration, part of the St Euthymus Monastery of our Savior complex. This church is now a museum, and so women do not need to cover their heads to enter. Inside are the most beautiful murals on the walls. Ceiling in the Cathedral of the Transfiguration. The walls of this church were beautifully painted. Parts were restored, but much of it was left so that you could really see the age. It was beautiful. More inside the Cathedral of the Transfiguration. An example of an old wooden church at the Museum of wooden Architecture and Rural Life. All the buildings in the museum were moved there from other towns in the region; so this is a real church (or once was). Herbs hanging from the roof in one of the peasant homes of the Museum of Wooden Architecture. More proof that I’m a city girl: do all geese have wattles like this? I’ve never seen them before.. I enjoyed this partially restored church and the clearly well-used playground in front. People do live in Suzdal, even if it seems to me that only tourists would want to. 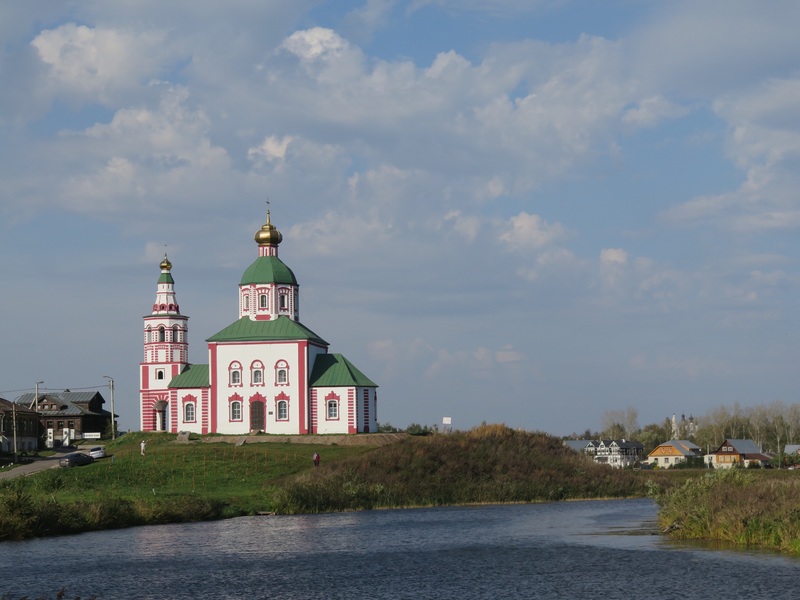 Edited to add: Steve talks about Suzdal in Vladimir and Suzdal.